Let’s say you’re getting some coffee, and then strike up a conversation with a stranger who just happens to be Bosnian. You’ll most assuredly end up getting invited for dinner at their house sooner or later. We’re friendly, what can I say? I can also guess with great certainty one of the meals they’ll serve you will be pita. Pita, in addition to ćevapi, is a Bosnian national food, also widespread everywhere in the Balkans. So what is this pita? Pita (pronounced “pe-tah”, with a strong, hard “t,” not “pe-da”) is a vegetable, meat, or cheese filled thin dough that’s baked, and then sprinkled with milk or butter at the end. The best pita is one made with homemade dough. 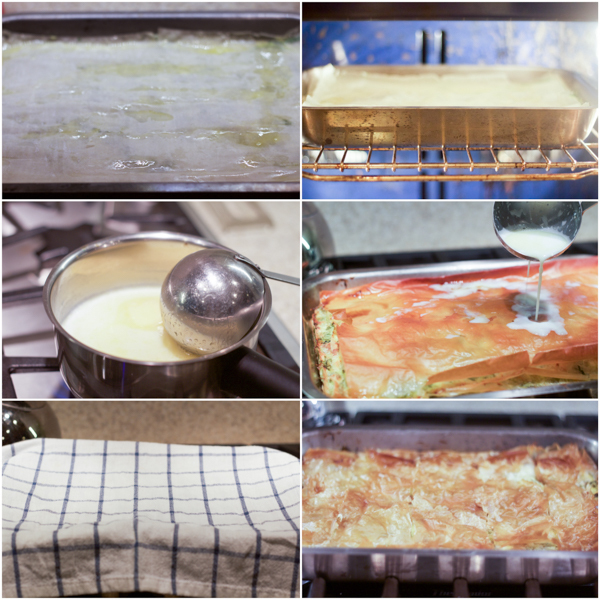 However, I wanted to introduce you to making pita in the most painless way (which in this case translates to using store bought phyllo dough), so that you actually have the motivation to make it. If you’ve never tried pita before, you’re probably skeptical. However, you will not regret this meal, and that’s a guarantee! I’ve explained where you can get phyllo dough in the baklava recipe. In short you’ll be going to your store’s freezer section. 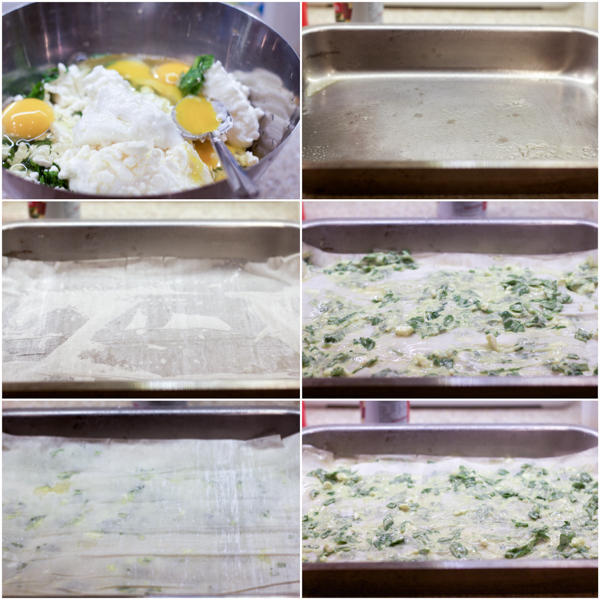 There you’ll look for long phyllo sheets. Once you start making pita, you can cut down the sheets to fit your pan exactly. However, since pita isn’t bakalva, you are also welcome to wrinkle the sheets a little bit until they fit. Both work fine. Another tip is to cut your spinach extremely fine, almost the size of parsley for the soup. This way you get all the goodness of spinach, without realizing you’re eating a lot of it. Your kids will love you for this! Happy spinach pie or pita zeljanica making! If you’re not big on crust, an excellent similar, spinach-y option is our CRUSTLESS SPINACH PIE. Kind of kind of quiche really, but even better and simpler. Also, if you’re more cheese than spinach, then the CHEESE PHYLLO PIE is your answer. Just as delicious and a bit less green. Want cheese with different vegetable? How about the EGGPLANT AND CHEESE PIE? Bet you haven’t had that one before! There are some of you that like spinach just by itself, and Aleksandra’s SAUTEED SPINACH will knock you out. The perfect side dish if there ever was one. Make it along eggs, meat, or just by itself. Uh! 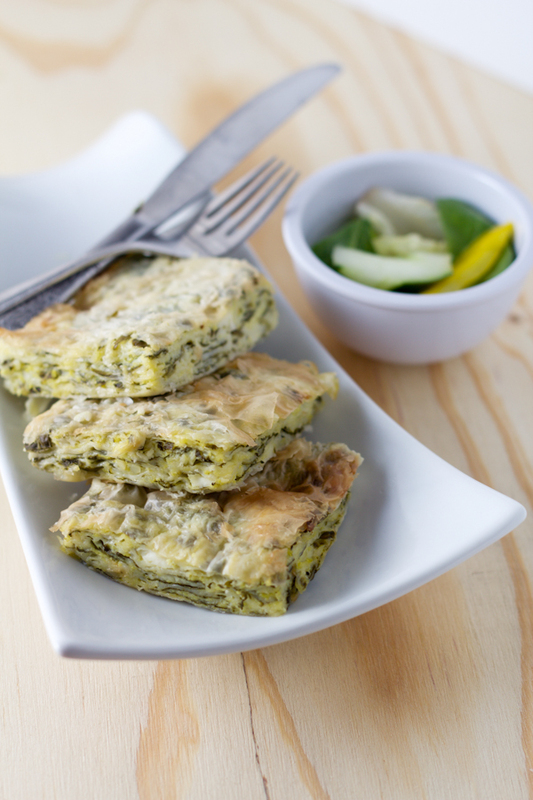 May we also recommend the beloved ZUCCHINI PIE? 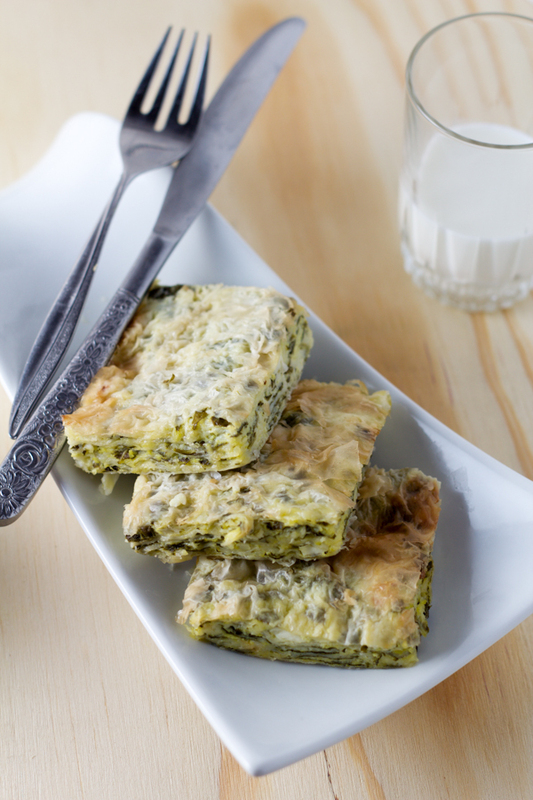 In a bowl, combine spinach, sour cream, cheeses, eggs and salt. Mix thoroughly until the ingredients are integrated. Grab a generous amount of the filling (4 to 5 tablespoons), and spread evenly over the top sheet. Layer 2 sheets on top of the filling, and brush each with oil before adding the next layer. Repeat until you run out of the filling and phyllo, making sure to leave 2-3 sheets for the top of the pie. Brush the top of the pie with oil, and place in the oven. Lower temperature to 395°F. Cover with foil after the first 10. Bake for a total of 30-35 minutes. I followed the recipe exactly as written and it turned out perfectly! The only thing I changed was the baking temperature, because my oven tends to run on the hot side. I baked it at 400 for 30 minutes instead and it was perfect! One question: would the recipe for cheese pie be the same minus the spinach? Yes! 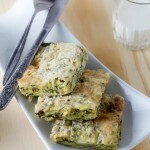 The recipe for the cheese pie (sirnica) is ultimately the same, although I also add feta cheese instead of spinach. Not as much, maybe 4-5 ounces, and then I mix it really well with cottage and ricotta (and rest of the ingredients). I’ll be honest with you, I still haven’t found cheese for pita that I’m crazy about in the US. In the Balkans they use fresh cow cheese, and it’s divine. I have found somewhat similar fresh cheese in Mexican supermarkets . Works great if you combine sour cream with it. This is my new favorite thing ever. I’ve been finishing up the leftovers all day. Amazing! 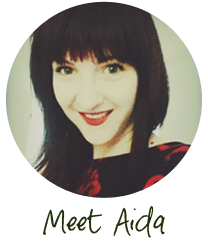 Hi, my name is Mirjana & I’m from Perth, Western Australia. I hope you can tell me if you have in english the recipes for both sweet & salty cheese pita & also something called Kipfle. I would love to make these. I appreciate your help with this. Your website is fantastic & I LOVE that it has the English translation of the recipes. Thank you so much. We don’t have the one for sweet cheese pie. Thank you for that. I know my mum makes both salty & sweet pita. If you like I will try to get the recipe from her as she lives interstate. Yes, I’d love to hear more about it.